In the vein of poetry collections like Milk and Honey and Adultolescence, this compilation of short, powerful poems from teen Instagram sensation @poeticpoison perfectly captures the human experience. 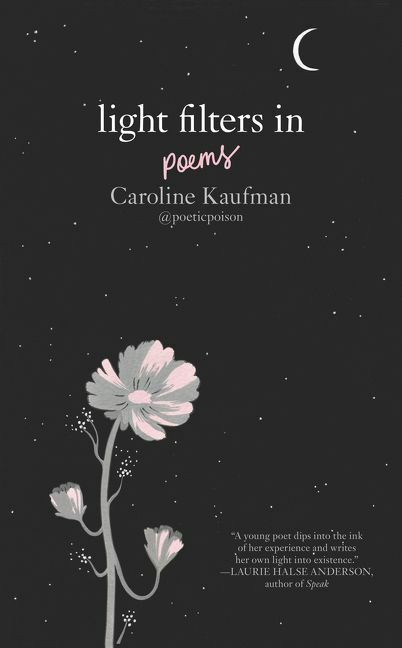 In Light Filters In, Caroline Kaufman—known as @poeticpoison—does what she does best: reflects our own experiences back at us and makes us feel less alone, one exquisite and insightful piece at a time. She writes about giving up too much of yourself to someone else, not fitting in, endlessly Googling “how to be happy,” and ultimately figuring out who you are. This hardcover collection features completely new material plus some fan favorites from Caroline’s account. Filled with haunting, spare pieces of original art, Light Filters In will thrill existing fans and newcomers alike. “Debut author Kaufman’s voice is authentic, and her experiences, feelings, and journey toward healing are convincing….